the chase scene." The chase scene began at exactly 10:23 pm. 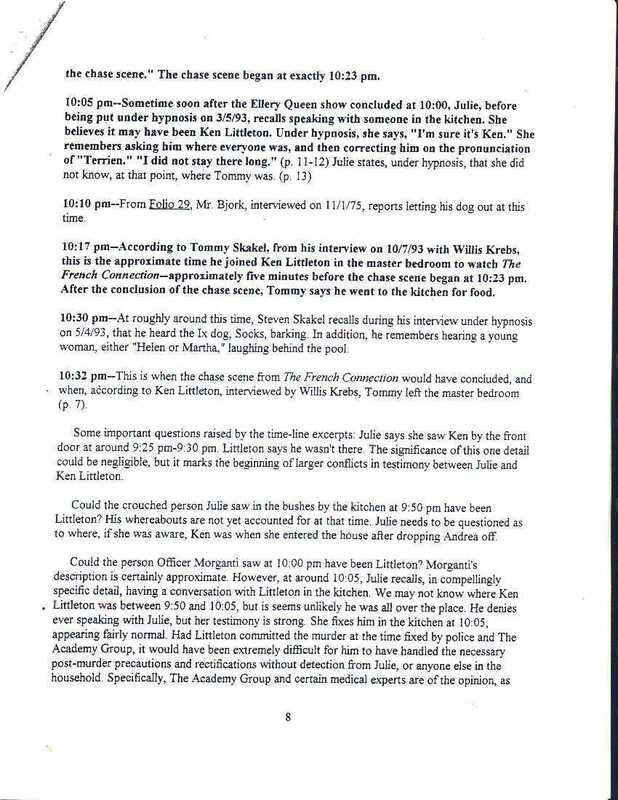 10:17 pm--According to Tommy Skakel, from his interview on 10/7/93 [footnote 1] with Willis Krebs, this is the approximate time he joined Ken Littleton in the master bedroom to watch The French Connection--approximately five minutes before the chase scene began at 10:23 pm. After the conclusion of the chase scene, Tommy says he went to the kitchen for food. 10:30 pm--At roughly around this time, Steven [Stephen] Skakel recalls during his interview under hypnosis on 5/4/93, that he heard the Ix dog, Socks, [Zock] barking. In addition, he remembers hearing a young woman, either "Helen or Martha," laughing behind the pool. 10:32 pm--This is when the chase scene from The French Connection would have concluded, and when, according to Ken Littleton, interviewed by Willis Krebs, Tommy left the master bedroom (p. 7). Some important questions raised by the time-line excerpts: Julie says she saw Ken by the front door at around 9:25 pm-9:30 pm. Littleton says he wasn't there. The significance of this one detail could be negligible, but it marks the beginning of larger conflicts in testimony between Julie and Ken Littleton. Could the crouched person Julie saw in the bushes by the kitchen at 9:50 pm have been Ken Littleton? His whereabouts are not yet accounted for at the time. Julie needs to be questioned as to where, if she was aware, Ken was when she entered the house after dropping Andrea off.